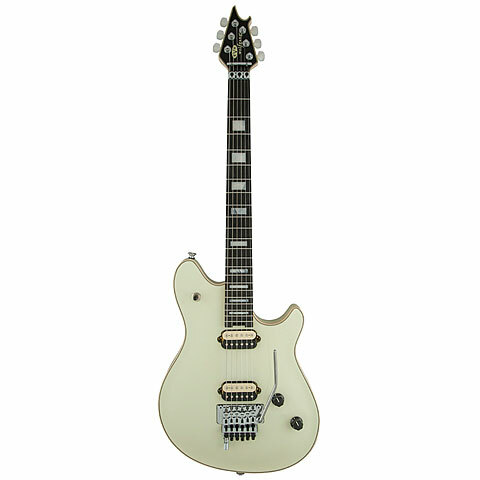 The EVH Wolfgang Ivory is a jewel from US production. Eddies Signature guitar in noble Ivory lacquer finish. The equipment meets the requirements of the master: Floyd Rose Tremolo with EVH D-Tuna, powerful Wolfgang pickups, durable stainless steel frets and the super-smooth Lo-Friction Potis. A case in EVH stripe optics is included. The EVH Signature Series includes guitars and amps that are manufactured according to the specifications of Guitar Superstar Eddie van Halen. In EVH program are powerful tube amps and diveres variants of the Wolfgang guitar.